It is November and a great time to start making warm hats. 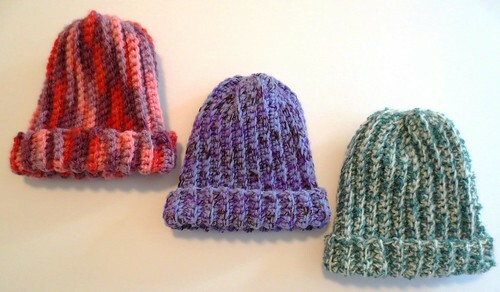 I crocheted these baby hats using a pattern from Beverly Qualheim. It is a free pattern with options for different baby sizes. I found that if I crocheted just 30 stitches to start the hat, it comes out just about right for a newborn baby. The pattern is quick and easy to crocheted and is worked side to side. Once done, you stitch up the seam and gather at the top to close. The finished size of my hats are 6.5 inches long flat by 10” cir. Once folded for the brim, the length is about 5 inches long. Overall I found the pattern very useful with all the different measurements for various baby sizes and a fun, fast pattern to crochet. The baby hats are so beautiful. Thanks for your sharing, my dear friend.